#DCG19: From Goa, with Drupal! 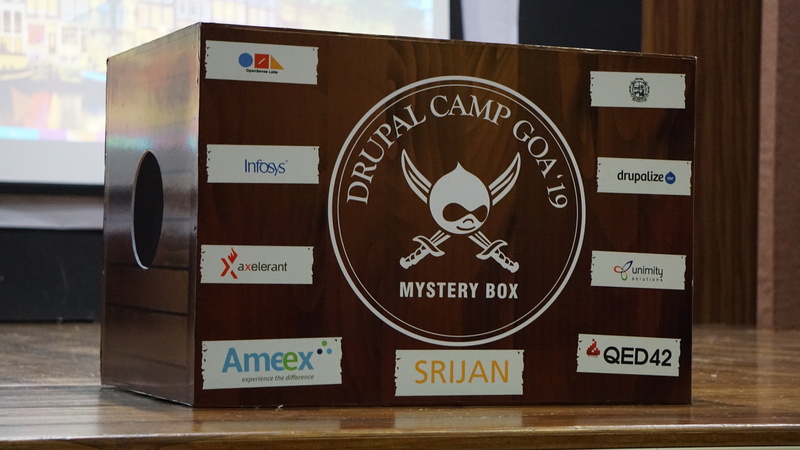 “India is the second top Drupal community contributor globally”, this sentiment echoed loud at DrupalCamp Goa 2019. The enthusiasm of the attendees was infectious. DCG was a two day camp conducted on 2 - 3 Mar’19 at Goa University. The event proudly hosted 160+ attendees, 20+ sessions, keynotes and several workshops. The day started early at 9 AM with a welcome note from Parth and I. The story of evolution of Drupal, DrupalCamps and the community was discussed in detail. We also introduced the ‘mystery’ box which got people excited. p.s. - The ‘mystery box’ was an idea that consisted of picking lucky winners for numerous trainings, D.O. memberships, certifications and more. This was followed with keynote session by Rachel Lawson, Community Liaison at Drupal Association. Rachel covered the challenges and solutions to bring the Indian Drupal community on the global map. The question of “if 13% of our code contributions come from India, do we have at least 13% of our group’s leadership represented by Indians and, if not, why not?” was addressed in detail. Other than diversity, Rachel also stressed upon how contributions to Drupal do not specifically revolve around coding and why non-code contributions are special. Find the full keynote here. We then dispersed for a break. Beautiful conversations brewed over ‘chai’ in sunny Goa, where people enjoyed visiting some of our sponsor booths; namely, Srijan Technologies, Ameex Technologies & QED42 Engineering, to talk about Drupal and future of technology. Also, many took this opportunity to quench their thirst on the live coconut water station. The camp moved on quickly with the second keynote session by Dan Venkatesan, CEO Ameex Technologies. Dan shared his experiences in running a Drupal company and discussed the evolution of Drupal while also pointing out the importance of talent, culture, and values. This gave way to a spree of sessions by the participants ranging from business & leadership, community, frontend, backend, CI/CD, and beyond Drupal. Also, in combination were two parallel workshops running throughout the day covering; PHP design patterns & DevOps. 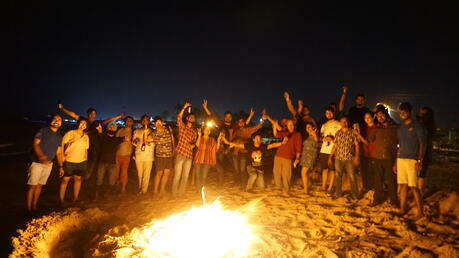 After an action packed agenda of 13+ classroom sessions and workshops, we wrapped up Day 1 and attendees headed for the party at a cozy shack by the beach. The after-party, officially sponsored by Simba, had a session of its kind, where the people indulged in games, dance stand-offs, bonfire and lots of beer, of course. Did we forget to mention awesome food? The final day had 8+ sessions lined up around application of emotional intelligence in Drupal, Drupal 8 test cases, getting ready for Drupal 9, voice search and much more. This was combined with 2 BoFs by Stephan Luckow & I and a full day Drupal codesprint. Birds of a Feather session (or BOFs) for our enthusiastic audience was an informal gathering of like-minded individuals to discuss “what is stopping you in Drupal contributions?”. Here’s a quick run down on the same. Faltering to the stereotypes such as "I am not a developer"
The group came to a unanimous call that various things basic in nature can help mitigate this. Organisations should encourage more contribution by running weekly/monthly code sprints at workplace, create a pool of mentor for better onboarding in the Drupal ecosystem and forge alliances to run more frequent camps/meet-ups nationwide. We closed the event by a thank you note by Rachel Lawson & I by handing over certificates of participation to all the attendees that were presented as a small token of tribute. The event was concluded with the final words from our advocate and event partner, Prof. Ramdas Karmali, from Goa University, with ‘Deu borem korum’ - thanking the attendees in the regional language of Goa, Konkani. To sum it up, we were moved to see the passion and commitment received for #DCG19. DrupalCamps are special, as an organiser, sponsor and speaker, DCG remains one of the most exciting projects I was involved with. We are excited to return to Goa in the summer of 2020. Until next time!